Will The Pacific Ave Streetscape Project Cause More Harm Than Good? Bizarre: Placing mis-designed harmful Walmart styled suburban buffers on Tacoma's mainstreet makes Tacoma less green, not more. See discussion on Exit 133. On May 9, the City will host an open house from 4 to 6 p.m. to solicit public input for the Pacific Avenue streetscape project that spans from South 7th Street to South 17th Street. The open house will be held at the University of Washington-Tacoma in the William W. Philip Hall, 1918 Pacific Ave. The project will include a new streetscape design, intended to help attract new business to downtown Tacoma and incorporate innovative stormwater management practices. The open house is an opportunity to review the preliminary design layout and to offer feedback. Because 1) this area of Pacific Avenue is currently functioning extremely well as designed, 2) the proposal to fill in much of the street with suburban type buffers where parking spaces are now would be very detrimental to the area, and 3) the significant impact on nearby businesses during construction such as on Paddy Coynes, Matador, Maconi's and many other Pacific Avenue businesses in the area would be more substantial, the city should re-asses the project with minimal disturbance to the vibrant street life and businesses in the area. The City of Tacoma is essentially trying to "fix" something that isn't broken on one of the few areas of downtown Tacoma that is property functioning that has not been decimated by the city. Below is a letter I sent to the city on the project with my concerns. You can email and mail your comments here. Please accept this letter as the public comment to the proposed changes to Pacific Avenue. My Office is located near Pacific Avenue and my clients and visitors often park on Pacific. The Complete Street idea in the Streetscape Project is a good one in theory. However, it can cause some damaging effects if carried too far. The Broadway LID did a great job in improving the streetscape while actually increasing the number of curb parking spaces. 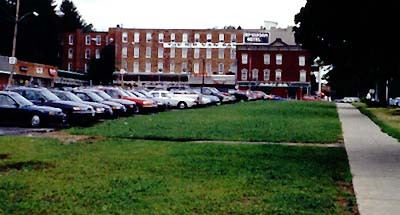 A number of different designs were considered and the city ultimately choose one than retained a good number of curb spaces. Curb parking is the gold standard for parking to enhance the life of a city and business who are considering moving into or being able to stay in downtown Tacoma. Curb parking should be maximized. Thus, my central concern to the Streetscape Project on Pacific is that it not reduce the number of available parking spaces on Pacific Avenue. Doing so would be very harmful to the businesses and life in downtown Tacoma and the use and enjoyment of downtown Tacoma. Empty building lots need buildings on them. Not surface level parking lots. The best streets in the world have curb parking. That is the best place to put cars. Better street trees would be a welcome improvement. However, the City of Tacoma needs to be careful it does not start fetishizing green and start placing green suburban type buffers where parking spaces are now. Downtown Tacoma need not try to imitate suburbia or a Walmart parking lot. This idiotic exercise in civic mis-design is called a green space. The Saratoga City Council strong-armed the property owner into scraping off a strip of parking lot in order to put this in. Its supposed to be a solution to a particular problem of poor civic design i.e., the fact that there is no building on this important downtown site. What has been delivered is a cartoon of a park. If you ask for an abstraction, youll get an abstraction. By the way, this stupid green space is right across our main street from an 11-acre park by Frederick Law Olmsted. Instead, curb parking in front of buildings should be maximized and buildings should be on building lots. by fredo on 5/9/2011 @ 8:27am These green strips may look great on an artist's rendition but if improvements are made which do not include a substantial amount of periodic funding for maintenance these treescapes become just a horrible tribute to bad design. I will site an example. The City of Tacoma Economic Development Department launched an "improvement" district like the one under discussion about 25 years ago in the Proctor Business District. None of the property owners asked any hard questions. The merchants were giddy and excited. The plan had money for purchase and planting of some trees. The trees were supposed to be small ornamentals which would enhance the street, not block merchants signage, crack the sidewalks and create problems for overhead wiring. No regular funding was identified, nor was the issue of who was going to maintain the trees and associated damage even discussed. The trees actually selected grew much bigger than predicted and it turns out they are a variety that needs a huge amount of professional arboreal attention. Of course the city claims they don't have adequate funds for maintenance. Until the city of Tacoma can come back to the Proctor District and rectify these landscaping errors they shouldn't be tackling any new projects DT or elsewhere. DT Property owners and tenants which will be affected have a golden opportunity right now to try and get the guarantees they most certainly will need in the future or derail the entire project. Don't believe for a minute any city official that says maintenance problems will be minimal or easily addressed later. by NineInchNachos on 5/9/2011 @ 8:28am Pacific Avenue is wide for two reasons: parades and street cars. Bring em back! by cisserosmiley on 5/9/2011 @ 8:43am these green spaces are awesome...given that they be deeded to any citizen willing to build a rsidential home on them and promise to reside there for 5 years minimum. by Jesse on 5/9/2011 @ 8:48am I've often thought that all of dt Tacoma should look more like the current Pacific Avenue. The design will hopefully create traffic and less hostile streets to walk down making pacific more pedestrian and store friendly... but that didn't happen on broadway when they narrowed that street did it? by fredo on 5/9/2011 @ 8:58am Look at the picture. 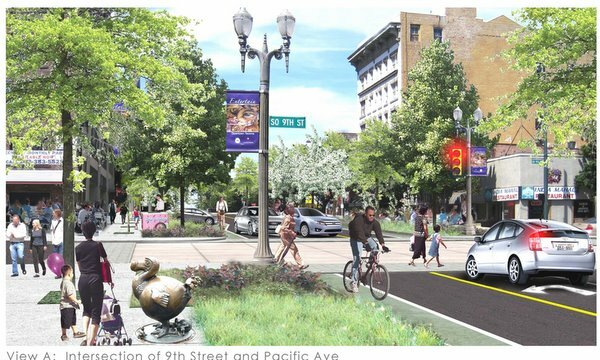 These proposed street scenes always include lots of white people with their little kids holding balloons, white people bicycling, very Ozzie and Harrietish. Where are all the saggy panted losers and tattooed welfare mamas? There's some subliminal marketing incorporated into this imagery. by cisserosmiley on 5/9/2011 @ 9:02am ya fredo, how come none of the buildings are decked out in "art" graffiti? why are there no for lease signs? why is it so clean in this dream tacomaniaville? by Joel 413 on 5/9/2011 @ 9:20am That picture must be reflecting a Friday on that Corner during the summer... which means a Frost Park chalk-Off is going on (Hence the people)... also notice the Street Vendor in front of Dorky's. Must be Jeff, since he's the only one. by fredo on 5/9/2011 @ 9:43am Dodo bird, heh good catch Joel. I think this discussion has uncovered the ultimate solution for Tacoma's problems...Photoshop! by The Jinxmedic on 5/9/2011 @ 10:03am A bad idea for the only functional stretch of Pacific Avenue. by KevinFreitas on 5/9/2011 @ 10:28am These changes are better directed somewhere else. I'd like to see all of Pacific brought down to one lane in either direction but, as Erik said, keep on-street parking, remove surface parking lots, and add some green/trees here and there then spend the money saved on doing something similar to another street rather than putting all the money into one spot that doesn't really need it. "Experience holds a dear school but a fool will learn in no other." by Erik on 5/9/2011 @ 11:22am The city could get a good result if they would handle it much like the Broadway LID which added some street trees and curb bulb outs at intersections. As for traffic calming, the current angled parking already narrows the road considerably creating quite a bit of traffic calming. Re: artist renditions. Yes, they can be extremely deceptive. After much "input" the plant that was built was much improved. Look at all of the pedestrians in the picture and a tree where the road used to be! It turned out to be a complete disaster killing off life and businesses in the area forcing the city to eventually open Broadway back up. There never were anywhere near the number of pedestrians being shown in the rendition. This few blocks of Pacific Avenue is one of the few blocks on Pacific that the City of Tacoma has not destructively "fixed" since it was designed and built about a 100 years ago. Check out the earlier fixes on Pacific Avenue: Tollefson Plaza, Wells Fargo Parking Garage wall, Sauro site, North and South Park Plaza Parking Garages. Almost every single "fix" has killed the pedestrian life in the area. by L.S.Erhardt on 5/9/2011 @ 9:56pm Why must this keep happening? Look to the north for once to get a good idea. 1st Ave in Pioneer Square is a good use of trees and maintaining curbside parking. Do something like that if you must change Pac Ave. don't make it like Bridgeport in UP. by NineInchNachos on 5/9/2011 @ 10:03pm ANYone pass through the commerce street area where the new Link stop is going in? the area gets plugged solid with link, buses and cars now. How a fire truck will get through there in an emergency is beyond me. Why this sudden interest in the needs of emergency responders? The city of Tacoma is engaged in allowing our streets to become a 3rd world cesspool of festering rubble that will slow emergency response. But funds which could have addressed this problem have been systematically allocated to frivolous pet projects (I will spare the readers a comprehensive listing). Ask yourself, which is more important, a pagoda that few people care about or a smooth pathway that will allow fire trucks to get to your house quickly? The only good thing I can see about the new link station is that the Frank Russell employees will be able to make good use of it's location. by The Jinxmedic on 5/10/2011 @ 8:25am This money would be better spent on Old City Hall. Seriously, though- this treatment would make much more sense on the part of Pacific Avenue blighted by parking lots- let's say from S. 13th Street to S. 17th Street. The north end of Pacific Avenue actually works well as is, and supports a small core of streetfront business- leave it alone. by fredo on 5/10/2011 @ 8:34am I'm glad there's a stop by the convention center and Tollefson Plaza to service the throngs of people hoping to visit these tourist meccas. by NineInchNachos on 5/10/2011 @ 8:36am My idea was to post the great white fleet parade photos of Pacific Avenue, but am frightened the result would be too depressing. by NineInchNachos on 5/10/2011 @ 8:38am How do they do it without nasty shrubs and dodo statues? by The Jinxmedic on 5/10/2011 @ 8:49am I love the shot of Old City Hall with the fleet on Commencement Bay. Soon, both Old City Hall and the very last surviving ship of the great white fleet, the cruiser Olympia will both be gone. by fredo on 5/10/2011 @ 9:02am Let's remove the last remaining parking spaces on Pacific Avenue so that a flock of bronze dodo birds can take wing. Mayor Strickland, your legacy is really shaping up. by cisserosmiley on 5/10/2011 @ 9:22am eric anderson, you are a moron and a lier. the majority of "people" in tacoma do not want this intrusion. i believe "most people" in tacoma would favor investment in the "uptown" tacoma area (from prospect to pearl and from n. 26th to center st.) i will prove this to you in coming months. thank you. by NineInchNachos on 5/10/2011 @ 9:36am Keep your dodo statues, restore the Old City Hall. Send the current owner into forced labor at Camp 6 where he can still do real damage to historical artifacts. But dammit, nothing is going to keep us gritty Tacomans from having our dodo birds. by The Jinxmedic on 5/10/2011 @ 10:07am Did anyone else notice how that Prius is in the process of flipping into the air after jamming on its brakes to prevent hitting the fake people in the crosswalk? by fredo on 5/10/2011 @ 10:11am the bicyclist isn't wearing a helmet. it's all part of Mayor Stricklands utopia. by NineInchNachos on 5/10/2011 @ 10:15am the yellow light timer was probably tinkered with to tease out more red light camera violators. by cisserosmiley on 5/10/2011 @ 10:20am where are all the cigarette smokers? Looks like they adjusted their position from turning the area into suburban buffer zone which some of the graphics seemed to suggest. A number of people wrote in with their concerns about the initial design wondering if it was going to cause more harm than good. Perhaps it did some good. The street is in great shape and many blocks in the area very vibrant as they are designed now. Innovation that avoids a “linear park” approach. Pacific Avenue is a commercial thoroughfare and should remain so. The initial artist rendition had one continuous (and useless) Walmart parking lot suburban “green” buffer running down the middle of the street. Having bulb outs might make the area a little more pedestrian friendly. Some of the street trees could be replaced and some sidewalks repaired. Other than that, I don’t see any need to make more changes that need to be made. The street and the parking system seems to be working well and be in great shape. The Pacific Avenue Streetscape project still seems like a solution looking for a problem. How unfortunate and detrimental to existing and potentially new businesses in the area. If the average stay in downtown is one hour, then the loss of 13 parking spaces would mean the loss of 13 × 9 = 108 visitors to Pacific Avenue per day and cost taxpayers $8,000,000. by Erik on 5/11/2011 @ 12:51am Kudos to Marty for trying to keep the "gold standard" curb parking on Pacific Avenue rather than having the parking spaces filled in with Walmart styled "not green" berms. by Erik on 10/11/2011 @ 10:49pm Here is the latest design released by AHBL, the design group hired by the City of Tacoma for the work on Pacific Avenue. Still too many bizarre "rain gardens" which strip some of the curb parking spaces in front of potential businesses. Just because some retail vacancies may exist on Pacific Avenue does not mean that that "rain gardens" should be erected on the street foreclosing the possibility of businesses being started there in the future. by tacoma1 on 10/12/2011 @ 4:44am I kinda like the ran gardens myself. Aesthetically I'd rather see some trees and plants in any city rather than just concrete for more cars. Cities are supposed to be for people to live work and play in. This obsession with where to put all the empty cars is over the top in Tacoma. by KevinFreitas on 10/12/2011 @ 7:30am I'm pretty happy with the new designs though not at all happy with the wire-hung light layer overhead that's proposed in there. DO NOT WANT more crap in the sky above me, thank you very much. Still wish the Link light rail would've gone with power by a third rail. by NineInchNachos on 10/12/2011 @ 8:05am the trouble with rain gardens if you are a city on hardpan soil... kplu.org/post/seattle-removes-rain-garde... you know like why Tacoma doesn't have underground parking garages? by Jesse on 10/12/2011 @ 8:42am I hope they're doing something about drainage out of these gardens. If they plan to filter storm water through the soil, they need to do something to guard against all those pre-1920's foundations especially between 7th and 9th. They are notoriously spongy and adding water in a place where there has been very little, could be the death of those buildings. Other than that, I like the rain garden idea as long as they don't end up looking like giant mud puddles. by Jesse on 10/12/2011 @ 8:46am Because of the rain gardens being introduced, aren't they putting in some angle parking? by tacoma1 on 10/12/2011 @ 10:49am It does rain in Tacoma so the rain gardens help to filter the contaminants in the runoff before all that water hits the bay. They are actually functional and important for the overall health of Commencement Bay. I would hope that someone has or will do a perc test a bore a soil sample to see what's actually under Pac Ave. My guess is that most of the native soil material has been removed long ago. Plus it'll give extra places for drunk people to pee. Or drunk dogs, cats, raccoons, opossums, etc. by Erik on 10/12/2011 @ 12:08pm The rain gardens are nice and green and certainly have a place in Tacoma as do other type of gardens. However, plopping them in the middle of the business district does more harm than good. There is still the hope one day that some of these areas might actually support businesses in them. by NineInchNachos on 10/12/2011 @ 12:15pm @erik Seconded! by Erik on 10/12/2011 @ 12:54pm One day, there might even be retail "Commerce" in the building where the Tacoma Pierce County Chamber of Commerce is located if the parking is not decimated in front of the building. by Nick on 10/12/2011 @ 3:11pm I don't mind things offsetting parking spaces if it's a fair trade. It's just that the benefit seems minimal and hardly worth giving up curbside parking for. I mean, if we were sacrificing parking spaces for a LINK stop, or maybe some kind of bike parking, or even a building or something, then I'd totally be for it. It just doesn't seem like aesthetics bring enough of a benefit to make the tradeoff worth it. by The Jinxmedic on 10/12/2011 @ 3:52pm @ Kevin- A third rail works on an undergound system- but on a street level system? Mwuhahaha! Fried dead things EVERYWHERE! by tacoma1 on 10/12/2011 @ 3:59pm If only we had more parking in Tacoma, then people would come. No wait we tried that. It didn't work. Maybe we should try something else next time. When you hear the phrase rain garden, you think of lovely, watery greenscapes that help save the planet by keeping dirty storm water out of Puget Sound. Mark Early, who is with the group Sustainable Ballard, says that�s exactly how Seattle Public Utilities (SPU) sold the street side rain garden project. Early says he thought it all sounded great. But, he says, the reality was a different story. by tacoma1 on 10/12/2011 @ 8:34pm So maybe the soil in Tacoma is the same as in Ballard, maybe its different. Hmmmmmmmmm, let me think, Ballard is close to or at sea level last time I was there. This part of Tacoma is several hundred feet above sea level. Off the top of my head, I would guess that drainage might be better in this part of Tacoma. Different topography, different soil, one should expect a different result. 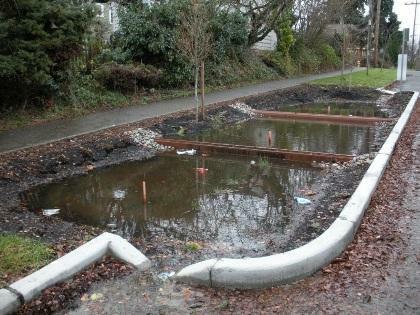 From the kplu article "clay soil in Ballard" the problem is obviously the soil in Ballard not all rain gardens. If there isn't clay soil under Pac Ave, drainage should be fine. Its pretty easy to test before hand. Without testing, anyone that claims the raingardens won't work is simple stating their bias, not a fact. by NineInchNachos on 10/12/2011 @ 8:48pm hard pack clay.. I remember BOE always saying that Tacoma has no underground parking garages because of the.... wait for it.... hard pack something or other. I forget what he said but when I first heard this on NPR I was like "dude that's going to be us"
by tacoma1 on 10/12/2011 @ 8:58pm I believe T Town is full of glacial till. Granite and glacial sediment. A simple bore test would tell us whats down there. No need to debate it. It is either water permeable or its not. A soil scientist is the one that can tell the city whats what, I don't think us bloggers will know. I do know that Ballard's soil problems have nothing to do with Tacoma. A quote regarding that very topic by Mr Boe himself. "I hear it a lot from people who come to Tacoma: 'How come there aren't underground parking garages?' Other cities have them and Tacoma seems to have above-ground parking garages,'" said Councilmember David Boe during the Feb. 8 city council meeting. He noted that cities such as Seattle and Bellevue are built on fill, making it easier to dig out space for underground parking. Not so in Tacoma, where most of downtown is built on hard rock. " You see,Tacoma is geologically, relatively close to Mt Rainier, It's glaciers, when they receded, left behind gigantic granite boulders to build on top of. We never pushed hilltop down into the tide flats and built our city in a valley like Seattle did. And it would be politically incorrect to do it now. by NineInchNachos on 10/12/2011 @ 10:34pm Thanks Tacoma1 ! by KevinFreitas on 10/12/2011 @ 10:54pm Geosciences degree to the rescue! I'd be willing to wager downtown is going to alternate basically gravel-like deposits and clay. If you look at the hillside along Schuster Parkway you can see this in a few places. As long as there's enough of the more permeable gravel there the water should drain well. This is also why we can't do subways or underground parking: no nice, solid bedrock to put it all in like New York which is pretty much blessed with bedrock right at the surface. by Nick K. on 10/13/2011 @ 12:42am Concerning third-rail.. There are bottom contact third-rail systems with safety shields. There was also a common method of "conduit third-rail current" that might be what you're referring to. Much like a cable car system (looks exactly the same), connected through a slot (center of rails) under street level. D.C. had that type of system prior to 1960's. In reference to Tacoma's experience with third-rail, the old Puget Sound Electric, between Tacoma and Seattle, used third rail south of Seattle city-limits, to about the Puyallup River, where it again went to trolley wire within Tacoma city-limits.